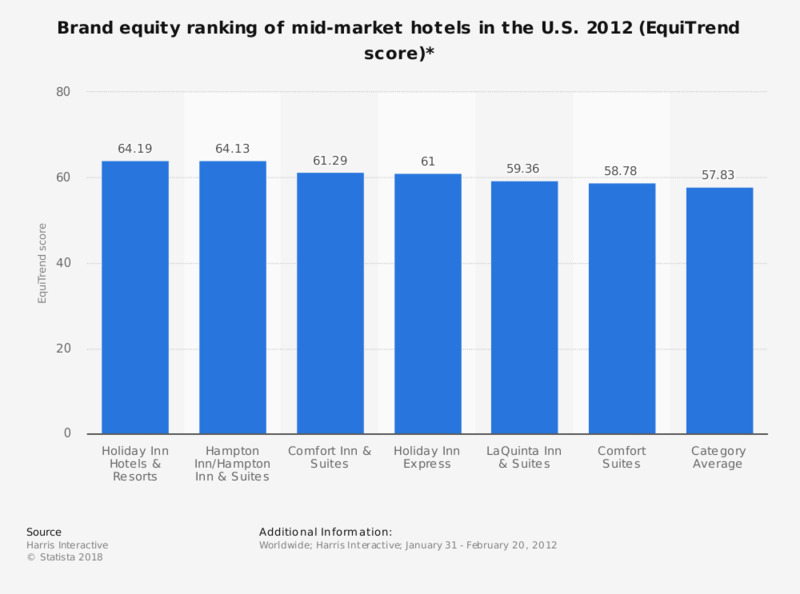 The statistic depicts the EquiTrend ranking of mid-market hotels in the U.S. in 2012. Holiday Inn Hotels & Resorts' EquiTrend score is 64.19 in 2012. Quality Inn and Sleep Inn (not included in this statistic) ranked below the category average. * EquiTrend is a Brand Equity tracking study conducted by Harris Interactive that measures and compares brand health for more than 1,500 brands. It analayzes the responses of over 37,500 consumers on key measures of brand health - including how well the public knows a brand, how positively they think of the brand and their consideration to do business with or donate to the brand.